After you’ve placed your secure order for your wedding gown preservation kit, you’ll receive your welcome kit in just 3-5 days. The kit measures 2’ x 2’ x ½” and will be delivered to the doorstep of your home. What is in the Wedding Gown Preservation Kit? Over the years, the kit has been continually improved to be safe and secure to give brides the peace-of-mind that her most treasured memory from her wedding day arrives without incident to the preservation facility. We’re proud to say that we have never had gown lost or damaged during transport thanks to the steps taken and technology integrated into the shipping process. After you fill out your return shipping paperwork and place your stain stickers on your gown, you're ready to begin packing your gown for secure transport to the wedding dress preservation facility. Unfold the heavy duty shipping container and tape seams with the included shipping tape. Place your gown and any additional items you'd like preserved into the preservation bag, tie it with the included zip ties and place the bag into the heavy duty shipping container. Use the last strip of shipping tape to seal the box and peel and stick your pre-paid shipping label onto the outside of the box. Call 1-800-463-3339 to have a driver meet you at your home to pick up your gown at no cost to you. 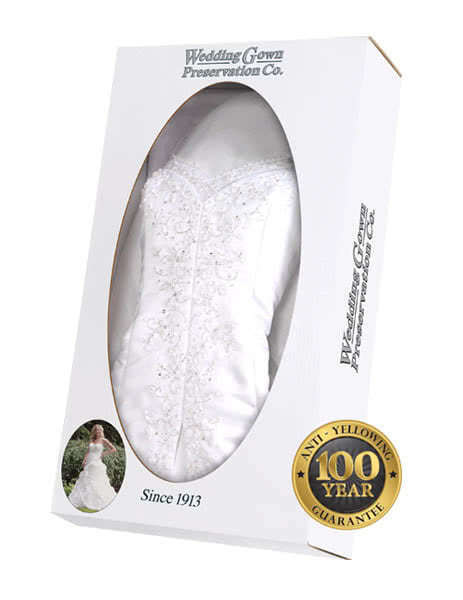 Your dress is now safe, secure, and on its way to a museum quality cleaning and preservation by a service trusted by over 3 million brides across America. Can I add more shipping insurance to my gown after my shipping package arrives? Absolutely. Within the paperwork that arrives with your kit you can check off the box for extra shipping insurance and include a check for the additional cost. Detailed instructions on how to calculate extra shipping insurance value is included in your paperwork. Can I have my finished gown shipped to a different address than my kit was shipped to? What are the three items I can send in with my gown to be preserved for free and which cost extra to preserve? Your three free accessories can include: veil, train, handkerchief, corset strap (lacing), jacket, shawl/cape, tiara, duster, garter, ring pillow, money bag, purse, gloves, sash. If you’d like to include more than three of the items listed above, each item is an additional $10. Items that we charge extra for include: slip, shoes, silk bouquet ($25 each). A check can be included in the box with your gown for additional items you wish to have preserved. Can I request extra repair work be made on my gown? Yes. There is a checkbox and a line item you can fill out if you feel additional repair work might be needed on your gown such as beading repairs or repairing a tear. The preservation facility has a master seamstress on location to handle such repairs. Can I have my kit sent to a PO Box? No. Our package requires a signature and must be sent to an apartment or home address. Can I request in the paperwork my gown be sent to an address outside of the US? Due to the size and weight of the final display box, we are not able to ship outside of the US and we’re also not able to ship to Alaska or Hawaii. Will I be notified when you successfully receive my wedding dress at your facility? Yes. We will e-mail you confirmation of receipt of your dress upon arrival and check-in at our facility. Please allow us 5-7 days after you send in your dress to receive confirmation.